NEW YORK (CNNMoney) -- Brace yourselves, peanut butter lovers -- prices are set to spike following one of the worst peanut harvest seasons growers have seen in years. Prices for a ton of runner peanuts, commonly used to make peanut butter, hit nearly $1,200 this week, according to the U.S. Department of Agriculture. That's up from just $450 per ton a year ago. It won't be long before consumers see this price increase reflected on store shelves. Kraft (KFT, Fortune 500) will raise prices for its Planters brand peanut butter by 40% starting Oct. 31, while ConAgra (CAG, Fortune 500) expects increases of more than 20% for its Peter Pan brand. A spokesperson for Unilever (UL), which makes Skippy, would say only that it's watching the situation "very closely." Representatives for J.M. Smucker (SJM, Fortune 500), which makes Jif, did not respond to a request for comment, though the Associated Press reported that Jif's wholesale prices are set to rise 30% in November. What's to blame for this sticky situation? The intense heat and drought that hit the southern U.S. this year, said John Beasley, a professor of crop physiology and management at the University of Georgia. "It was just unmerciful, and we had a lot of problems setting the crop," he said. "I literally walked some fields that had zero yield." In addition, Beasley said, high prices last year for other crops, such as cotton, corn and soy beans, led farmers who might otherwise have grown peanuts to focus their efforts elsewhere. Overall, U.S. peanut production will hit 3.6 billion pounds this year, down 13% from last year, according to a Department of Agriculture report released this week. Americans spend almost $800 million a year on peanut butter and consume more than six pounds of peanut products each year, according to The National Peanut Board, a farmer-funded research group. Sales may not be so smooth during the looming price crunch. 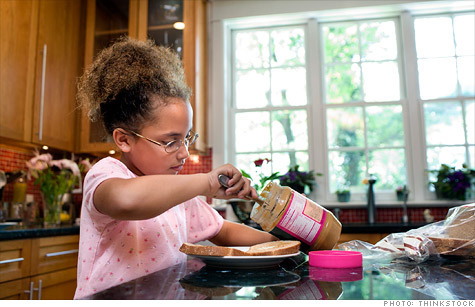 In any case, though, a shift in peanut butter consumption shouldn't make a huge difference to the nutritional quality of most Americans' diets, said Marion Nestle, a nutrition professor at New York University. "For the average person in America," she said, "it would be a good idea to eat less of almost everything."